According to a survey conducted by the AARP, nearly 90% of seniors want to remain in their homes as long as possible (otherwise referred to as “aging in place”). Jeffrey Lubell, the former Executive Director at the Center for Housing Policy, explains why staying at home is important for so many seniors. 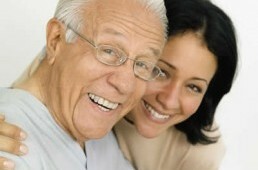 The financial benefits of aging in place are significant. According to information provided by the AARP, the average cost of a nursing home is more than $50,000 per year. Many seniors must pay for nursing home costs out of pocket, as Medicaid (the federal and state insurance program for those with lower incomes) will only cover nursing home costs once seniors have spent almost all of their savings. The longer seniors can remain safely in their homes, the more of their hard-earned retirement funds they can save. Some modifications, such as chairlifts and walk-in showers, require significant resources. However, there are some low-cost modifications that seniors and their families can make to “seniorize” their homes and allow them to age in place as long as possible. Below are some helpful tips, provided courtesy of the TV station KCET.org. Add remote switches for lights and fans (such as those that go on by clapping). Clear pathways, remove throw rugs and repair loose carpet or flooring. Add handrails to stairways or other areas of the home with uneven flooring. Install grab handles in bathrooms and nonskid mats in and around the bathtub and near the toilet and sinks. Add nightlights in hallways and bathrooms. Use portable shower chairs and long handle brushes to help with showering. Store household items on lower shelves, and if you must use a step stool, use one with handrails. Install smoke alarms and carbon monoxide detectors, get a fire extinguisher for the kitchen, and create an emergency escape plan. Need Help with Accessibility Modifications? If you need more extensive modifications and cannot afford to make them yourself, there may be nonprofits in your area that can help. Through our Texas Foundations Fund, TSAHC supports critical home repairs and accessibility modifications provided free of charge to very low-income homeowners. Click here to read more about our partner nonprofits and the services they provide in communities throughout Texas. I really like the idea of adding different light switches, like those that clap on and off. That would help my grandmother a ton! She actually leaves her lights on all the time because she gets in her chair or in bed and forgets to turn the lights off. I’ll mention this to her and see what she thinks! You’re right about how most seniors would rather live in their own home. My dad has been having trouble taking care of himself though, so I’ve been considering sending him to a nursing home so that he can get the care that he needs. I like that there’s a way to make his home more livable for his condition. Installing stair lifts and adding handrails to the halls with uneven flooring will make it easier for him to live at home. I can’t be there to keep an eye on him, so perhaps I’ll consider hiring a home care specialist while I’m at it to make sure that someone is looking out for him. Thanks for the tips!